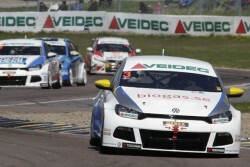 After completion of the second round of the Swedish Touring Car Championship, at Knutstorp last weekend, the drivers of all four biomethane-powered VW Motorsport Sciroccos, two each for Team biogas.se and IPS Team Biogas, are placed in the top six on the championship table. In a tight battle with two conventionally-powered WTCC-specification Chevrolet Cruze 1.6T competitors the 2.0 litre turbocharged Super 2000 spec Volkswagen Scirocco teams believe they will continue to improve, looking forward to the forthcoming Malmö event to test out vehicle handling adjustments. 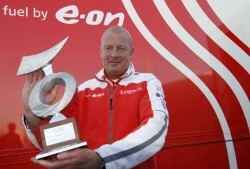 Tommy Kristoffersson, Team Manager of Biogas.se holds the champions trophy for STCC 2011. 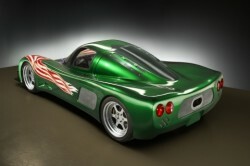 Biomethane power outperforms competitors in the 2011 STCC. The Swedish Touring Car Championship (STCC) is halfway through its racing calendar for 2011, having completed 10 races over 5 weekends. 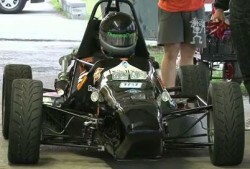 The CNG-fuelled collegiate race car leaves the OSU workshop, headed for a world record. 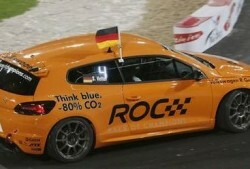 Ekblom celebrates his third win of STCC 2011.